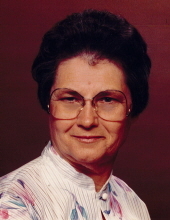 Inez Ihnken Ward, 91, formerly of Colo, IA, wife of the late Vernon Max Ward, passed away Friday, January 25, 2019, at her daughter’s home in Travelers Rest, SC. Born in Sac County, IA, she was the eldest daughter of the late John Frederick and Doshia Burtcheard Ihnken. Inez graduated from Wiota High School in 1947. She and Max were married in Boone, IA, on June 3, 1951. She was a homemaker and a member of Colo United Methodist Church. Olson (Rick) of Travelers Rest, SC; sister Helen Rossell of Atlantic, IA; granddaughters Jennifer Heagy (Steve), Abby Rowe, Michelle Carson (Justin) and great-grandson Brayden Carson. Along with her parents and husband she was predeceased by four brothers. To send flowers or a remembrance gift to the family of Inez Ihnken Ward, please visit our Tribute Store. "Email Address" would like to share the life celebration of Inez Ihnken Ward. Click on the "link" to go to share a favorite memory or leave a condolence message for the family.